Xiaomi Mi5 is going to announced a few days after Galaxy S7, as off now the flagship handset from the Chinese OEM is definitely looking very impressive. The next flagship should also packed all features that we expected. 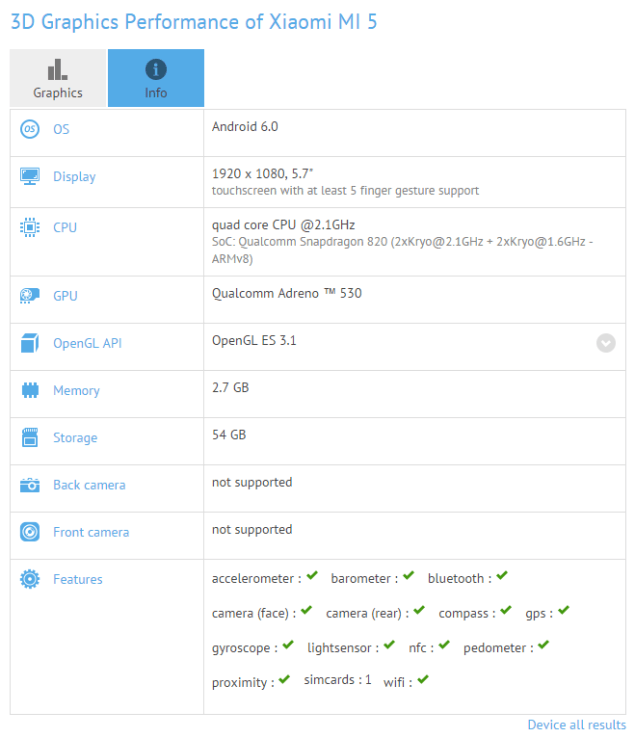 According to GFXBench, the popular mobile benchmarking app, Xiaomi Mi5’s hardware specs have been leaked. As we already know that mi5 will packed Snapdragon 820 underneath with maximum clock speed of 2.2GHz and Adreno 530 with 3GB of RAM. Xaiomi decided to go with 1080p 5.7” inch display, rather than a 2k display for maximize the battery performance, as 2k displays not that great for battery life. Xiaomi Mi5 runs Android Marshmallow 6.0 out of the box with miui on-top and should utilizing the RAM more efficiently.